Following the debate, conference votes on whether to carry or defeat the motion. GDPC take these decisions very seriously as they are the opinions of the dental profession at large. Usually it will derive from your LDC with the Secretary or Chair asking for ideas which might make for a good motion subject, maybe a topic the LDC had discussed at previous meetings which raised some passionate debate. Creating a conference motion for the first time can be challenging and then having to stand up and present it at conference – well that can be a daunting experience! Motions relate to any aspect of the working lives of all dentists and the care of their patients. They can relate to local dental issues affecting only constituents from your LDC or alternatively be a concern of a national nature. At past conferences motions have covered the GDC, contract reform, commissioning guides and stress in dentistry. Take a look at the 2018 motions here. The wording of the motion should be carefully considered, yet carry the sentiment you want to convey. It should also ask conference to support your proposal. To whom is the motion directed? Conference calls on GDPC or GDC or BDA……. Sometimes it might just be an expression of anger, joy, etc. At other times the motion might be one that sets up a debate. Conferences believes that the NHS should only provide screening and diagnosis of dental issues. Keep it simple. Avoid calling for multiple actions by various bodies which make the motion unwieldy and open to amendment. The motion should not contain the supporting argument – this proves a distraction and takes away from the message the motion is trying to convey. The supporting argument is provided by the Proposer at the podium. Two or three lines should be sufficient. Who do you want to support your motion? Because the delivery of dental care can vary across each of the four devolved nations, certain motion topics will be voted upon only by those countries involved. For example, issues involving UDAs would be limited to delegates from England and Wales whereas public health concerns could well be applicable to all nations. Your motion may originate from a local issue but more often than not, the same issues could arise elsewhere in the UK. Therefore, the wider the support your motion can gain, the more powerful the message will be for GDPC to act upon it. The final selection of submitted motions is made by the LDC Conference Agenda Committee (AC). Often, the Agenda Committee receive several motions on a similar topic, and it is their role to identify similar motions and to group them together. This makes the message stronger and gives more weight when presented to the General Dental Practice Committee (GDPC). Debating of motions is an essential and vibrant part of Conference but it is fair to say that after multiple presentations on the same subject, enthusiasm for the discussion can wane! Should you receive a request from the Agenda Committee to amend or amalgamate your motion with another on a similar topic, then please be understanding. They are simply trying to give your motions the greatest impact at conference. If a motion is proposed which is already GDPC policy, the Agenda committee will, in conjunction with the Chair of GDPC, decide whether the topic would benefit from further consideration to give it re-affirmation or go straight to a vote as per Conference Standing Orders. The deadline for submissions is set so that the Agenda Committee have sufficient time to consider the order of the motions and for the timely production of printed materials. Please do read the letter from Vijay Sudra Conference Chair 2019 highlighting what he wants from motions this year. His guidance can be found here. Note there will be a slightly different presentation of the motions in the agenda papers this year. The deadline for motion submission is Tuesday 2 April. Standing Orders outline in more detail the procedures for submitting motions, the rules of debate, amendments, voting and also includes rules for Emergency Motions (where it is deemed essential by the Chair that a decision be made at Conference at short notice). When your LDC submits the motion wording, you need to say who will be presenting it to Conference. This is your designated conference delegate. Observers cannot propose or vote on the motions, but they can speak to or against them with the Chair’s permission. If you’ve not presented before, it is advisable to write down your arguments and practice them – you only have three minutes to say your piece and this is not negotiable. If you are a first-time speaker, please introduce yourself as such and conference will respect this. Other delegates may then speak to support or oppose your motion. When the Chair feels that all the debate from the floor is completed, then you will have the opportunity to clarify points raised by previous speakers limited to one minute. Conference is then asked to vote whereby your motion is carried or defeated – democracy in action. 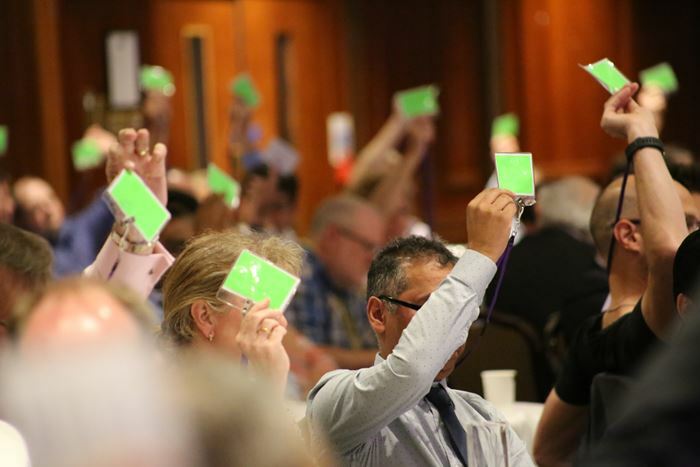 General Dental Practice Committee then considers all of the motions passed by Conference at their next meetings often passing them onto its relevant sub-committees for action.